This week viewers couldn't watch Nepali channels on tv as agitating cable operators shut them off to pressure the government to meet their demands. And the demands? Reduction of taxes and royalty. The standard operating procedures for taxis with grievances is to park on the Ring Road to obstruct all traffic in and out of the airport. Garbage is piling on the streets because someone in the rubbish chain is protesting about something. The Maoists who last week announced they wouldn't close down newspapers anymore to press for their demands announced an indefinite nationwide school closure from Monday. Good for them they withdrew that drastic action otherwise there'd be all hell to pay. The issue then becomes, should not a parent as a 'consumer' be able to get an adjustment on the fees or should not the school be able to adjust teacher's pay for the days the school's revenue is affected? Wednesday was supposed to be a banda, no one knew who was calling it or why, but that wasn't important. What was important was that the rumours had spread so everything remained closed. 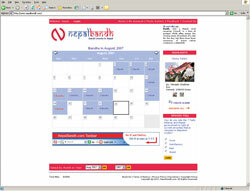 Now, there is even a website www.nepalbandh.com where one can check out future bandas so that one can plan one's life around them. "Necessity is the mother of innovation," noted one wag. A consumer who subscribes to cable television has entered into a contract with the cable operator for the number of channels 24 hours a day for the duration of the contract. The price one pays is for the service for that whole duration. Therefore, if the operator decides not to broadcast a channel then the price should be reduced. Parents should stop paying for every day that a school is closed, or school buses are not plying. If a restaurant is closed on a particular day there should be a discount on the days when it is open. Let's start looking at these closures from a consumer's perspective. If there are three hours of load-shedding a day, we should be compensated through a tariff rebate during periods when there is electricity. And how about variable salaries where the existing salary is broken down into fixed and variable components depending on the days businesses remain open. Why should an employer pay for the days that an employee stays at home outside stipulated holidays? Perhaps this is the only way to make sure people will struggle against bandas, teachers will ensure schools remain open, parents will demand schools not be closed, and employers will raise their voices against forced closures. Nokia has just spent millions of dollars to recall their phone batteries. Ford withdrew a vehicle with faulty suspension. Fischer Price has taken out toys with excessive lead. They aren't stupid, they spend millions of dollars to avoid legal costs and damages that may ensue from faulty products. The problem in Nepal is that contracting law is weak and there is no protection for the consumer. We can sue the cable operator, but nothing will happen. The time has come to really look at a firmer legal framework between service providers like schools, hospitals, cable operators to bolster their legal options against forced closures.